Much ink and paper have been expended on the Civil War. But most of it has been for the professional observer’s recollections or research results. Even most memoirs are after-the-facts, studied writings, self consciously edited. Here is something different—the as-it-was-happening chronicle of two persons caught up in the events themselves. 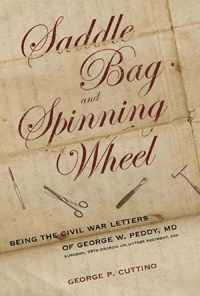 Here are 216 letters, the personal correspondence between George Washington Peddy, surgeon, 56th Georgia Volunteer Regiment, CSA., and his wife Kate. More of his letters (166) than hers (50) survived. Nevertheless the chronicle is complete (October 1861–April 1865). The letters were edited by a grandson of the letter writers, Georgie Peddy Cuttino. Cuttino, a professional historian himself, recognized the value of these documents in their original form. The spontaneous intimacy, the grammatical and spelling idiosyncrasies, all in the vernacular of the times, it is all here, unchanged. What results is an unstudied, and consequently genuine and believable, portrayal of life during those trying times. This is the stuff of which real history is made—a chronicle of the unfamous about whom the historian knows so little but would like to know so much.